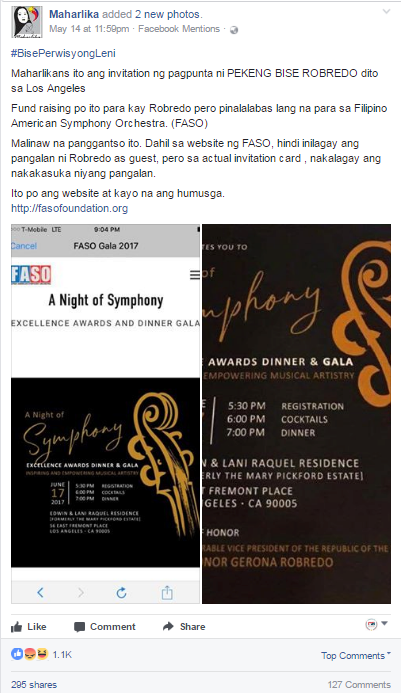 Pro-Duterte blogger Maharlika claimed in May that the Filipino American Symphony Orchestra (FASO) was organizing a fundraising event for Vice President Leni Robredo but that they would make it seem like it was for Fil-Am musicians. 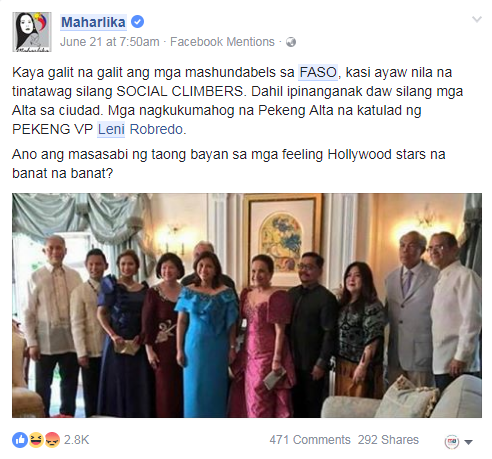 In the video she posted on May 14, Maharlika answered a netizen’s question about FASO’s fundraising event. She said that it was indeed for Robredo, although FASO is trying to pass it off as a fundraising for the organization and its beneficiaries. 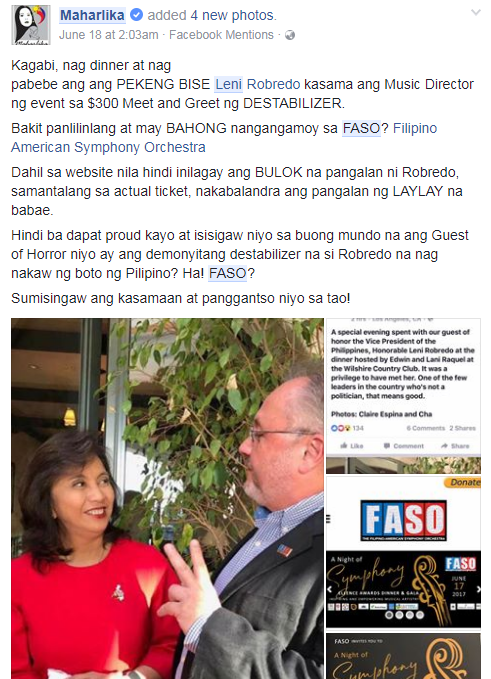 She also posted a photo of FASO’s invitation, along with a caption echoing her claim that FASO’s dinner and gala event was intended to raise funds for Robredo. 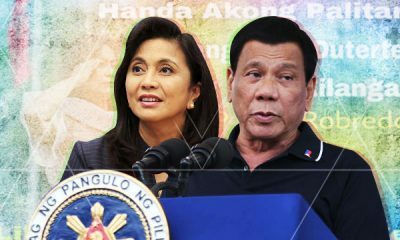 “Fund raising po ito para kay Robredo pero pinalalabas lang na para sa Filipino American Symphony Orchestra (FASO),” she wrote. 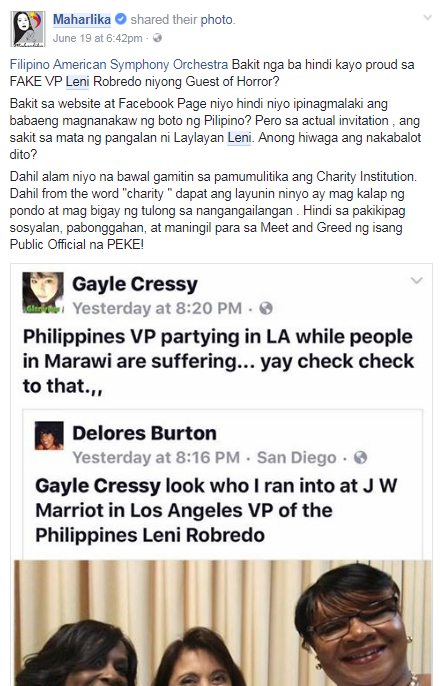 This tidbit of information was picked up by another pro-Duterte blogger Thinking Pinoy, who slammed that $300 fee for Robredo’s meet and greet and who further asked if the Vice President is raising funds for her daughter’s Harvard studies. On June 19, she asked why FASO was not posting about Robredo on their website and Facebook page. She posted this on June 21, this time, targeting the attendees of the event. And yet another post on the same day, where Maharlika claimed that FASO will charge her and have her arrested. 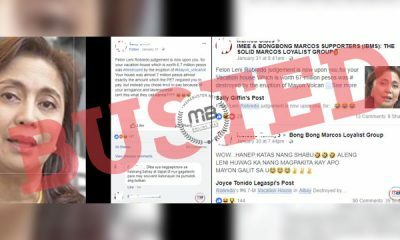 In response to Maharlika’s accusations against FASO, the organization’s legal adviser Claire Espina posted a “public call for information” on June 22 to know the real identify Maharlika and to debunk her lie. Espina also posted on the Facebook group #NeverAgain: No to Dictators, to Martial Law, to a Marcos return to power” on June 23 an explanation of FASO’s nature as a nonprofit corporation and how Maharlika has committed libel against and defamed FASO. 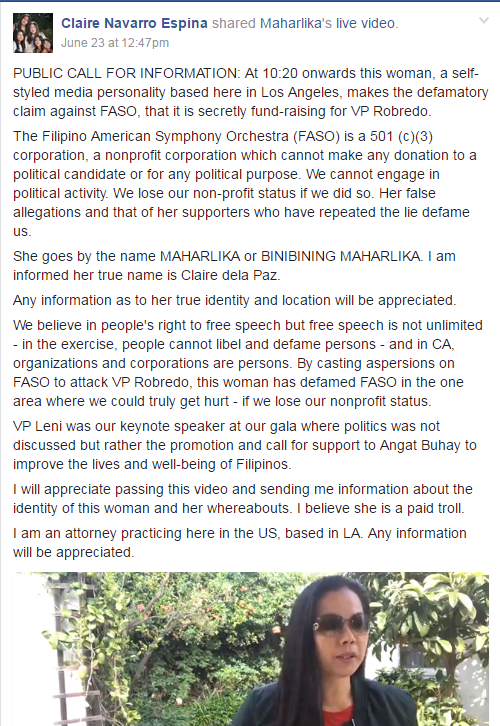 “The Filipino American Symphony Orchestra (FASO) is a 501 (c)(3) corporation, a nonprofit corporation which cannot make any donation to a political candidate or for any political purpose. We cannot engage in political activity. We lose our non-profit status if we did so. Her false allegations and that of her supporters who have repeated the lie defame us,” Espina wrote. “We believe in people’s right to free speech but free speech is not unlimited – in the exercise, people cannot libel and defame persons – and in CA, organizations and corporations are persons. 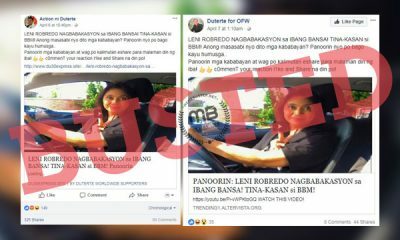 By casting aspersions on FASO to attack VP Robredo, this woman has defamed FASO in the one area where we could truly get hurt – if we lose our nonprofit status,” she added. Espina even dared Maharlika to reveal her name and address and to provide proof for her claim. Espina also posed a question about whether it should be right to ask Maharlika “to account” for her mug-selling business, which will supposedly help other Filipinos, and whether she has a business license to sell online. It was also on the same day that Espina shared Meme Buster’s post about Thinking Pinoy issuing an erratum over his earlier post showing a “fake photo” of Robredo’s oil portrait being sold on eBay because the Vice President cannot afford to have it shipped to the Philippines. Espina also responded to Maharlika’s claim that she would go to prison when charged by FASO. “FAKE NEWS AND DRAMA: Libel and Slander are mere civil torts in California. No one goes to jail for being found liable for libel or slander. The claim that she will be jailed (ipakukulong) is FAKE NEWS AND FAKE DRAMA,” Espina wrote. “FOLKS, SERIOUSLY: Let us all work together to call out fake news. We need to establish the historical record of the push back,” she wrote. “Trolls have power only when they are not called out. People of goodwill have collective power. Let us not ever forget that,” she added. In another post, she simply said: “Got it!” It seemed like she finally got Maharlika’s identity and address. On June 25, Espina wrote about how a “pushback against fake news works,” seeing as how Maharlika has stopped talking about her “false allegation” against FASO and how the interview Maharlika had with PCOO Asec. Mocha Uson showed one more “important detail” about the US-based blogger. The interview can be seen here. On June 27, Espina seemed to be reminding Maharlika to “preserve evidence” after receiving legal notice. She also replied to this comment. This is Espina’s latest post about her pursuit of Maharlika and her “libelous” statement against FASO. We can check in on her Facebook page for more updates.